Hillary Clinton’s private emails found: FBI reportedly recovers some of the private emails Clinton tried to delete for good. The FBI Found Emails Hillary Deleted. That’s Great News For Her—if She’s Been Telling the Truth. 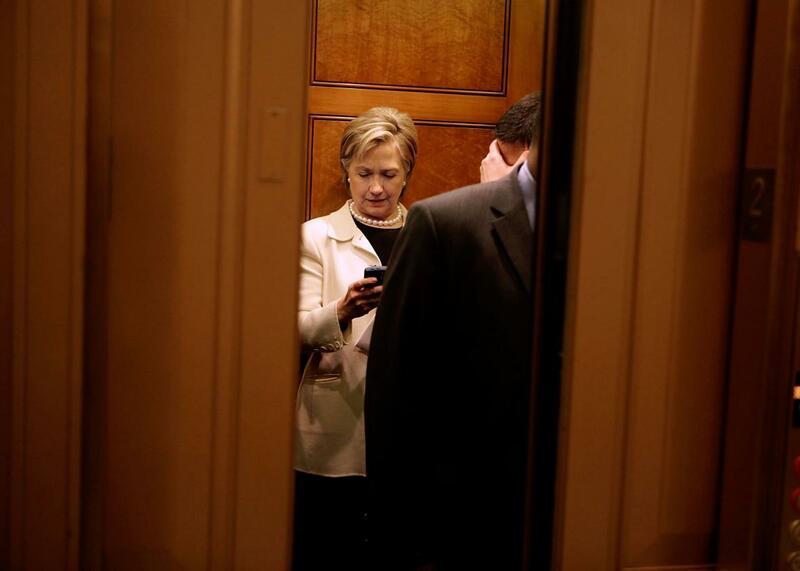 Then-Sen. Hillary Clinton looks at her BlackBerry while on an elevator at the U.S. Capitol on January 7, 2009. Hillary Clinton maintains that she and her team erred on the side of transparency when deciding which of her private emails needed to be turned over to the State Department for archiving, and which could safely be deleted. We may soon find out if that claim holds up. Bloomberg and the New York Times report that, according to unnamed sources, FBI investigators have “recovered” an unspecified number of work-related and personal emails from Clinton’s personal server that her lawyers had previously suggested had been deleted for good. To state the obvious: That could be a big problem for Hillary. Since she and her team decided for themselves which messages were work-related and therefore needed to be turned over in hard copy before being deleted, and which ones were personal and therefore could be junked outright, voters were left to simply take the Democratic front-runner’s word that she played by the rules. The latest news, though, suggests that regardless of whether Hillary had her server “wiped” clean, investigators will now have the chance to double check at least a portion of Clinton and her team’s work. As I’ve previously explained, we already know that self-sorting process was, at best, an imperfect one. In June, for example, the State Department said that more than a dozen Libya-related messages that former aide Sidney Blumenthal had sent to Clinton were unaccounted for in the trove she turned over to the agency. The only reason we know those emails exist at all was because Blumenthal, a longtime friend of the Clintons, turned over his copies of them to the congressional panel investigating Benghazi. In the meantime, the continued drip-drip-drip of email-related news won’t do Clinton any favors on the campaign trail. While she has not been accused of doing anything illegal—the FBI is currently only focused on determining how classified information was handled in connection with her account—the probe will keep the email controversy in the news. And at this point, pretty much any email-related headline that’s not “Clinton Fully Exonerated By Everyone, Wins Endorsement From GOP Benghazi Chairman Trey Gowdy” is a bad one for Hillary. For (much!) more on Clinton’s private email saga, check out this detailed Slate explainer from earlier this summer.